The product that Ward Cedar Log Homes uses is Perma-Chink Energy Seal™. A thoroughly tested blend of acrylic polymer that dries to form an elastic, durable surface, Perma-Chink requires little-to-no maintenance. It is perfectly textured and colored to blend beautifully with the natural tones of a Ward Cedar Log Home, and it can be stained just like the logs. What are the steps to apply the caulking? First you will want to prep your log home. The logs should be cleaned and dried. Also make sure you have installed the backer rod. 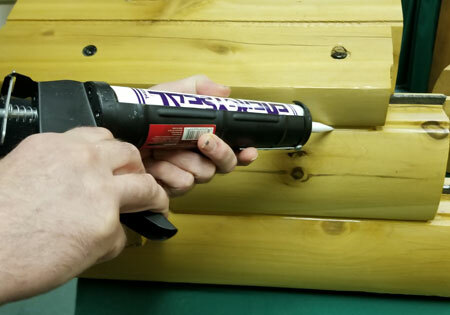 The backer rod provides a non-adhesive surface so the caulking, which acts like an elastic band that expands and contracts with the wood, will stick only to the upper and lower wood surfaces of the groove. You will have to pay attention to the weather as well. Freshly applied sealant should be protected from rain until a water resistant skin has formed which is usually 24 hours after application. wood surface temperatures should be between 40 and 90 degrees Fahrenheit. Next is the application. Cut the applicator tip to the desired opening of the sealant bead you want to apply. You will want to hold the applicator tip firmly against the seam and apply a bead of sealant. Caulk all joints over the backer rod to fill balance of the joint leaving the drip edge exposed. It is desirable to tool or "strike" exterior caulking joints directly after application to ensure good adhesion. While sealants are easily gunned into a building joint, they do not necessarily adhere properly to all of the joint surfaces. Tooling of the sealant allows proper adhesion. Now it is time for clean up. If you get any sealant on the surface of the wood, be sure to wipe it off immediately with a wet rag. Dried sealant is difficult to remove. Curing and drying times can vary depending on the temperature and humidity. The sealant may begin to skin over in as little as ten minutes but the cure time may take up to a few weeks. For more about Perma-Chink visit their website.